I have helpers that readers of this blog don’t ever hear from and who I don’t thank enough. They send me corrections when I’ve misidentified plants, reveal the names of plants that I don’t know, and pass along tips about places that might be worth a visit. 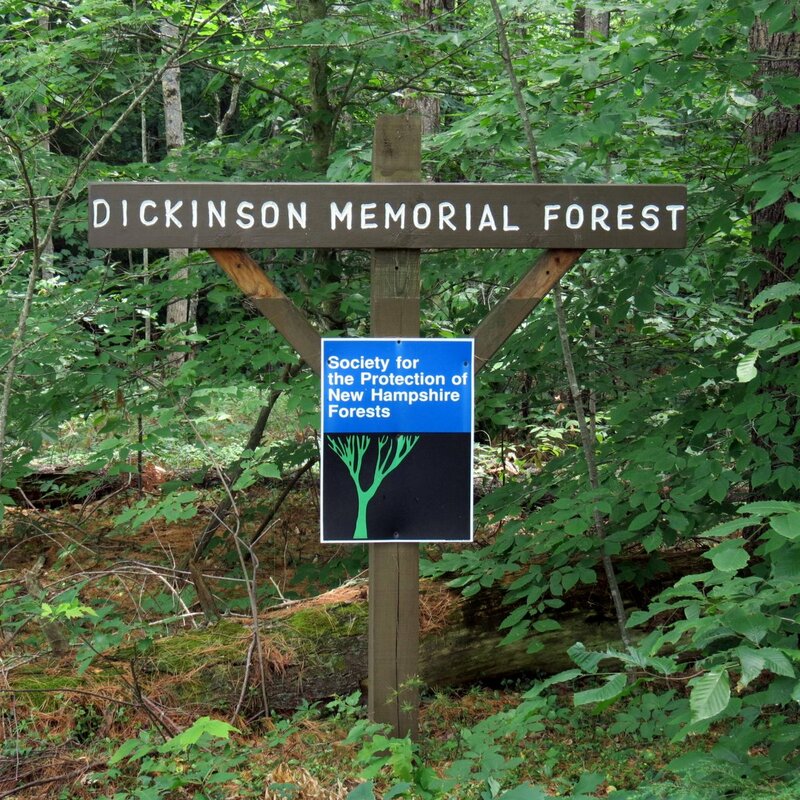 One of the places mentioned recently was Dickinson Memorial Forest in Swanzey, which was once owned by a prominent local family. Since I’d heard of it but had never been I decided to visit. 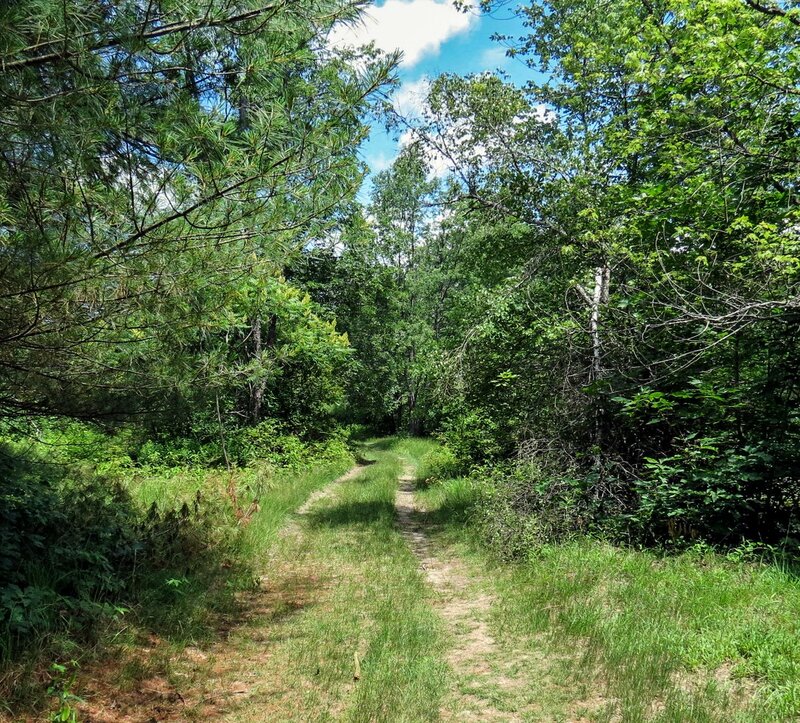 When you’ve reached this point you have a choice to make; you can turn right and follow the trail into the forest or you can follow this old road into Muster Field, so named because volunteer firemen used to muster and train here. I followed both but my first choice was through these old gate posts. 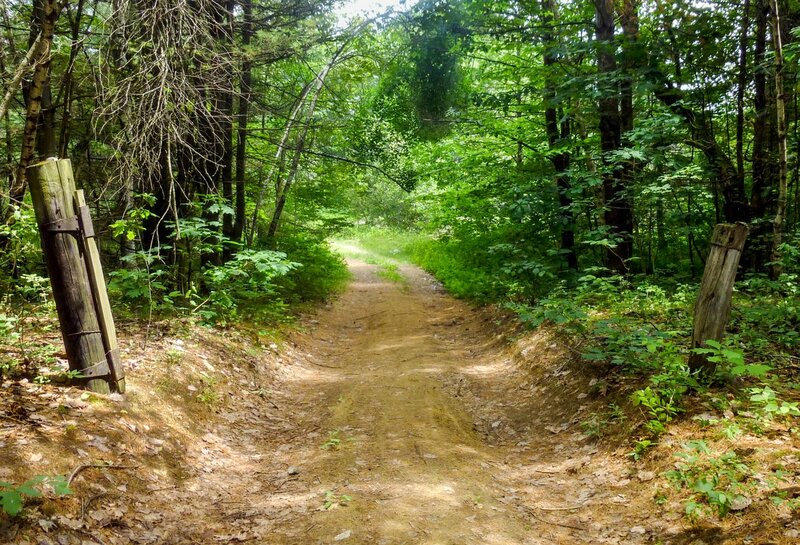 I chose the old road because it follows the Ashuelot River which is off to the right, and because this is just the kind of place that I spent large parts of my boyhood exploring. Before I left this place my spirits had soared and I was feeling like a kid again and smiling from ear to ear. I’ve returned several times since because for me being out here is like walking into a time machine. Old friends like striped wintergreen (Chimaphila maculata) told me that this land has been this way without being disturbed for a very long time. I’ve read that this plant won’t grow on land that has been disturbed within the last century. It grows either in the woods or just at their edges; places where the plow wouldn’t have gone. I rarely see it and I think this is only the third or fourth place that I’ve found it. It’s very happy here and is going to bloom soon. Shinleaf (Pyrola elliptica,) another of our native wintergreens, grew in a large colony here. This plant’s common name comes from the way Native Americans used it as a poultice to heal wounds; especially shin wounds, apparently. It contains compounds similar to those in aspirin and a tea made from it was used for many of the same ailments. The nodding white, waxy flowers are fragrant and very hard to get a good photo of. 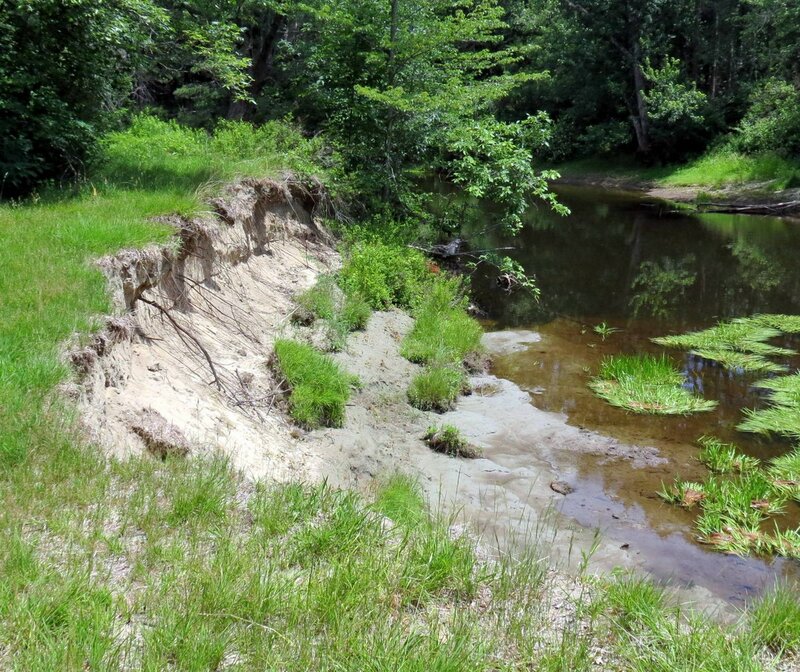 The river is doing what rivers do, which is eat away at their banks. Large sections of the silty embankment in this area have fallen into the river several times recently by the looks. In one spot it has fallen away right to the edge of the road. I drove out here one day not realizing just how close to the road the undercut embankment was, and I’m very lucky that my truck and I didn’t end up in the Ashuelot. Since then I haven’t driven past the gate posts in the second photo, but someone really should put signs warning people not to drive out here. The reason I drove out here that day was because I was short on time and I wanted to see if the Canada lilies (Lilium canadense) that I saw on a previous visit were blooming. They weren’t then but they eventually did. I think that these plants succeed so well because they get tall enough to rise up above the surrounding vegetation to where the sunshine is. They soar to 7 feet tall sometimes and remind me of chandeliers at this stage. In 1857 Henry David Thoreau was told by a Native American guide how the bulbs of this plant were cooked with meat in soups and stews to thicken them, much like flour does. Henry dug some and ate them raw, finding that they tasted somewhat like “raw green corn on the ear.” I’ve always been told that lilies were toxic when eaten so I’d say Henry was a lucky man. Cooking must remove the toxicity, which would explain how natives ate them regularly. 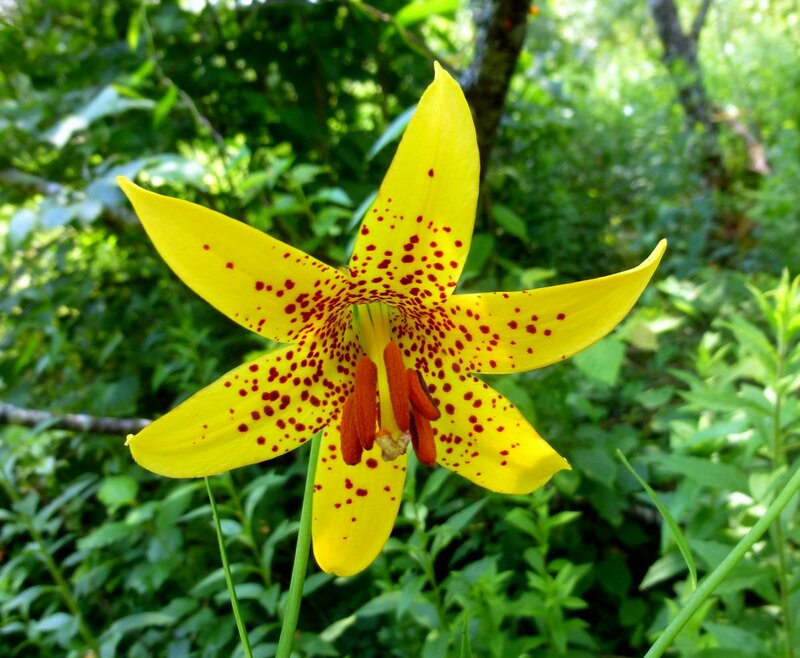 It’s nearly impossible to confuse the beautiful flowers of Canada lily with any other. Its large size, spotted throat, large red anthers and bright yellow petals and sepals make it unique among wildflowers in this area. We do have another native lily called the wood lily (Lilium philadelphicum,) but its blossoms are orange and point to the sky rather than nod like these do. 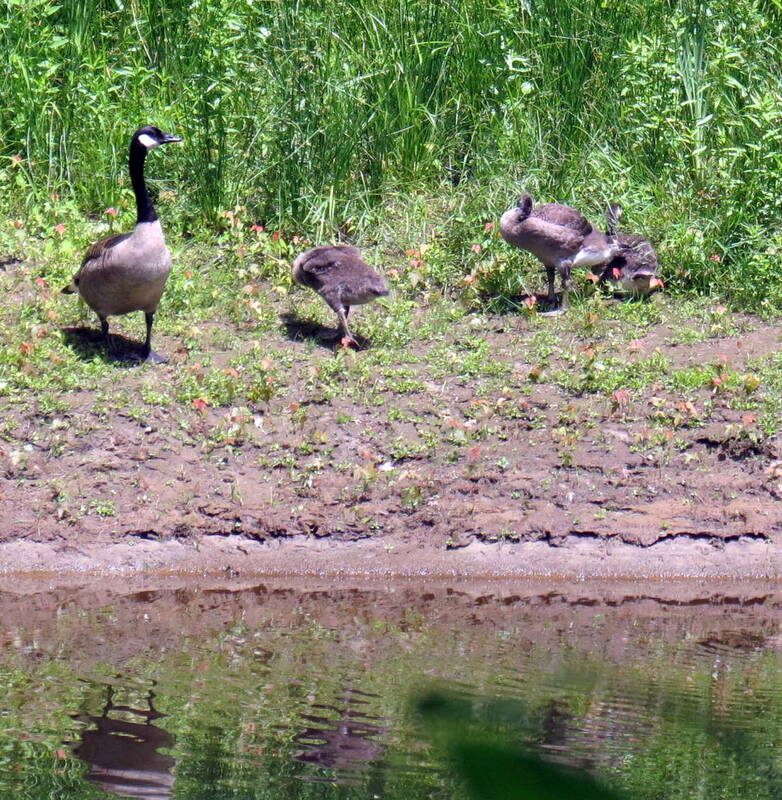 A family of Canada geese relaxed on the far bank of the Ashuelot. This photo shows how low the water level is. 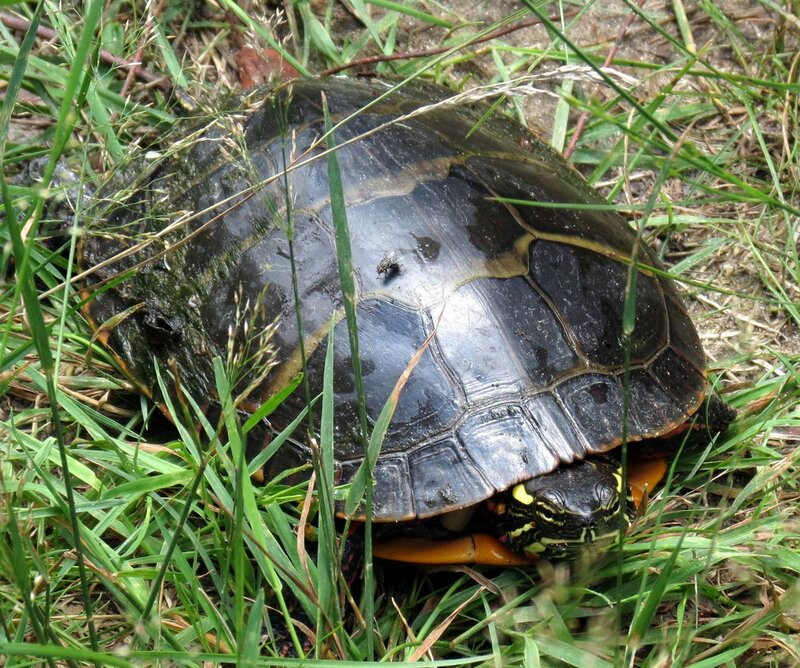 A turtle was out for a stroll on the old road. She didn’t say where she was going but I’m assuming that she was looking for a suitable place to lay her eggs. She must have had quite a struggle to get up here from the river. 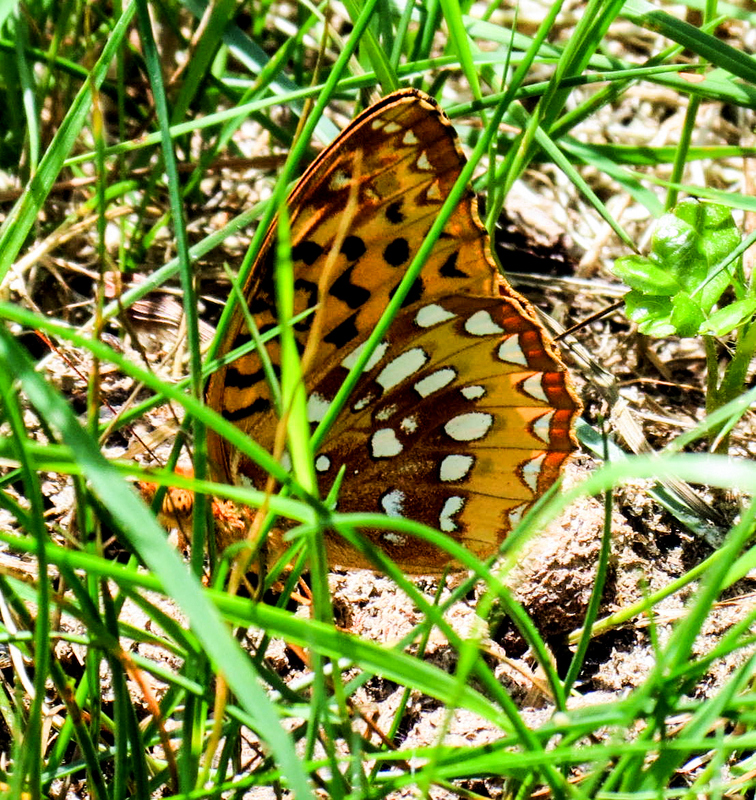 A spangled fritillary hid in the tall grass at the edge of the road. They and many other large butterflies love Canada lilies and like me were probably waiting impatiently for them to blossom. 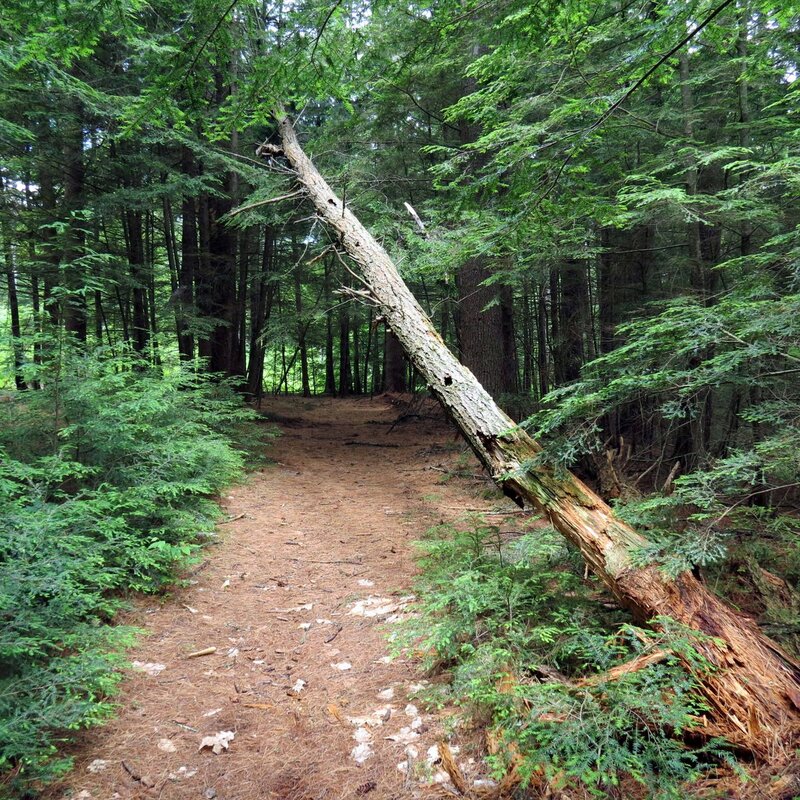 In the Dickinson forest a dead tree had fallen across the trail and was hung up on some hemlock branches. This is a dangerous situation and I hope whoever maintains these trails will remove it. It wouldn’t take much of a breeze to blow it down and I hope there isn’t someone under it when it falls. A boardwalk and footbridge crossed a seasonal stream, which just a muddy ditch at this time of year. I didn’t see any deer but I wouldn’t be surprised if they saw me. 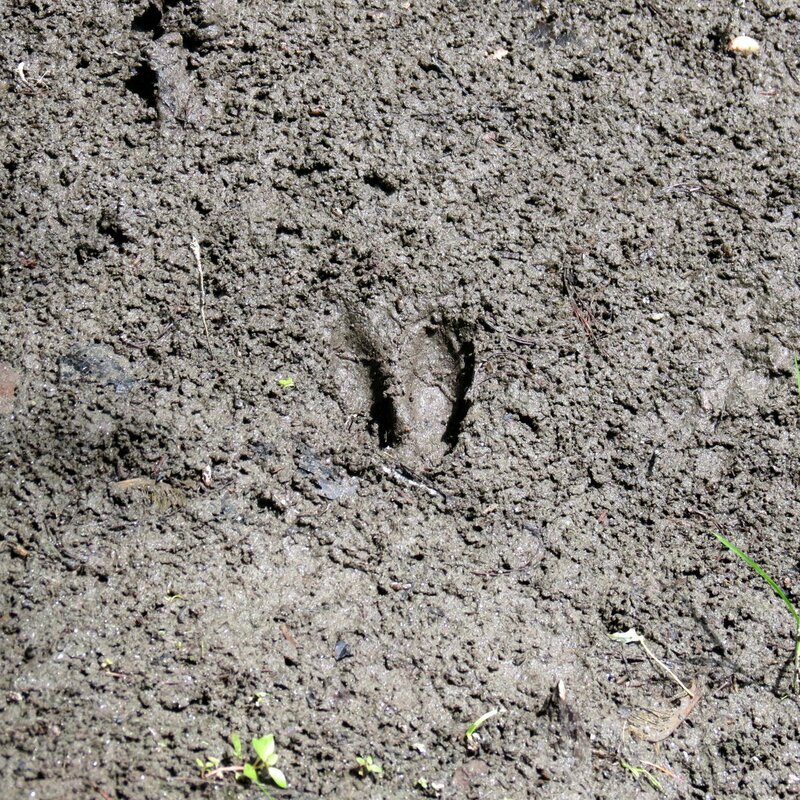 This hoof print looked very fresh. 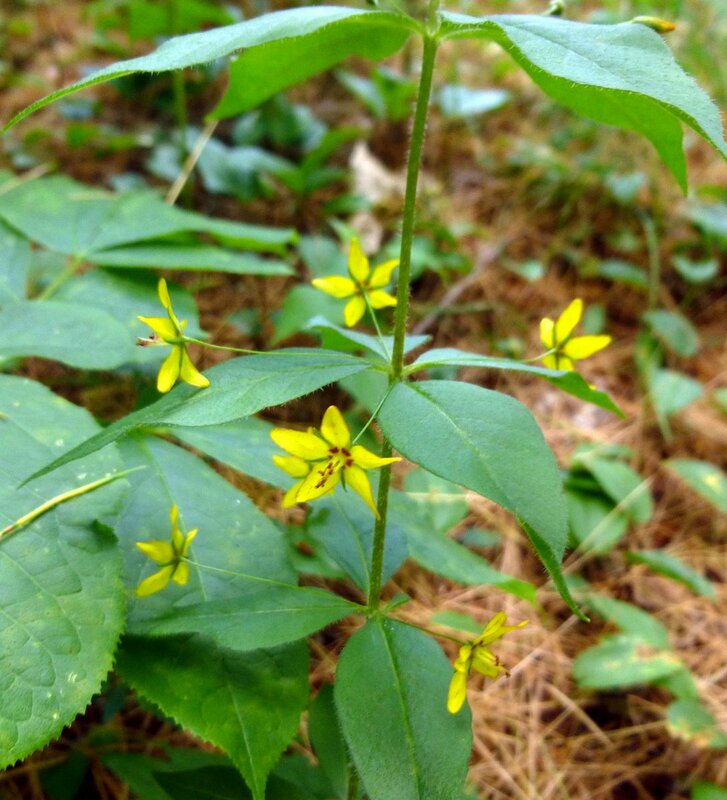 Whorled loosestrife (Lysimachia quadrifolia) grew all along the river. This pretty little flower has quite a long blooming season and it and its cousin the swamp candle (Lysimachia terrestris) can be seen in moist areas throughout the hottest months. Its common name comes from the way its flowers and leaves grow in a whorl about the stem. Native Americans brewed a medicinal tea from the stem and leaves of whorled loosestrife to alleviate kidney ailments. The biggest surprise here was finding false hellebore. It grew quite a distance from the river, which I thought was odd because it usually grows as close to water as it can. 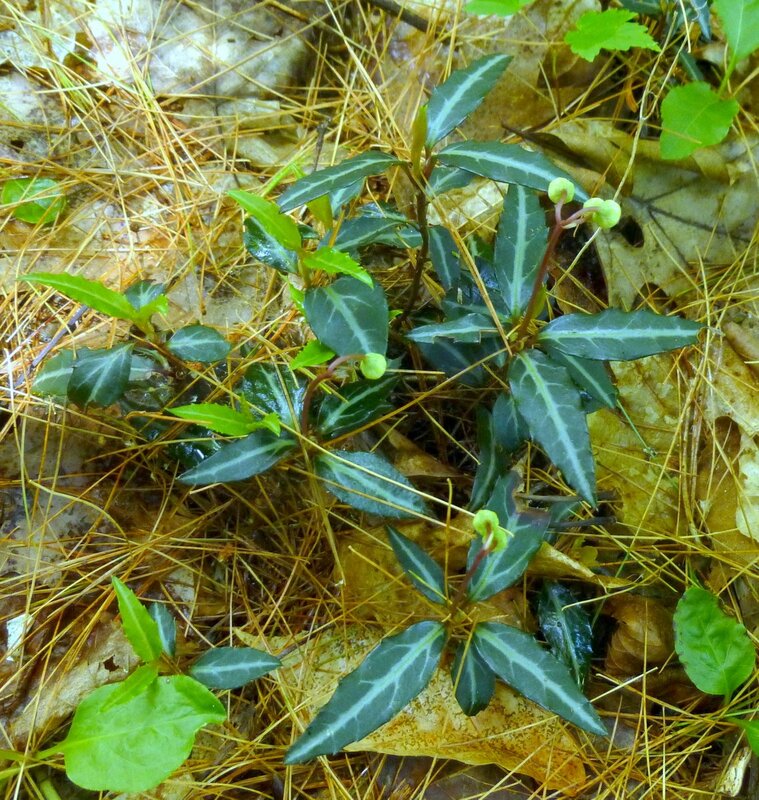 False hellebore is one of the most toxic plants in our forests. Eating just a small amount can be lethal and people have even gotten sick from drinking water that it grew in. 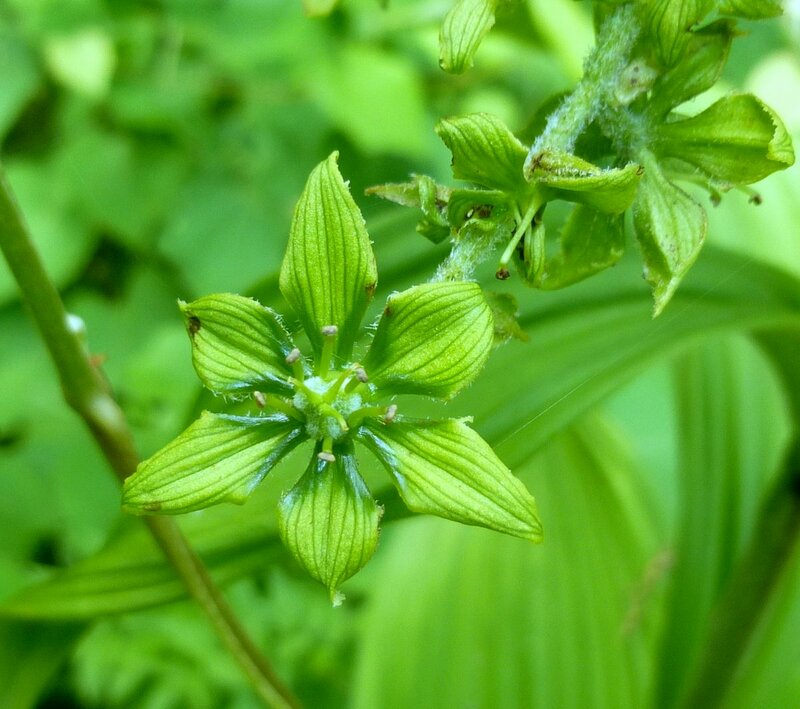 Even more surprising than finding the false hellebore was finding that it was flowering. That told me that these plants had grown here undisturbed for quite a while. Only mature plants will blossom and can take 10 years or more to do so. The bright yellow anthers were missing so I knew these flowers had nearly gone by. I never realized that the flower’s green petals and sepals are as pleated as the leaves are. There are pairs of nectar glands at their bases and ants visit the flowers to feed on their sweet treats. 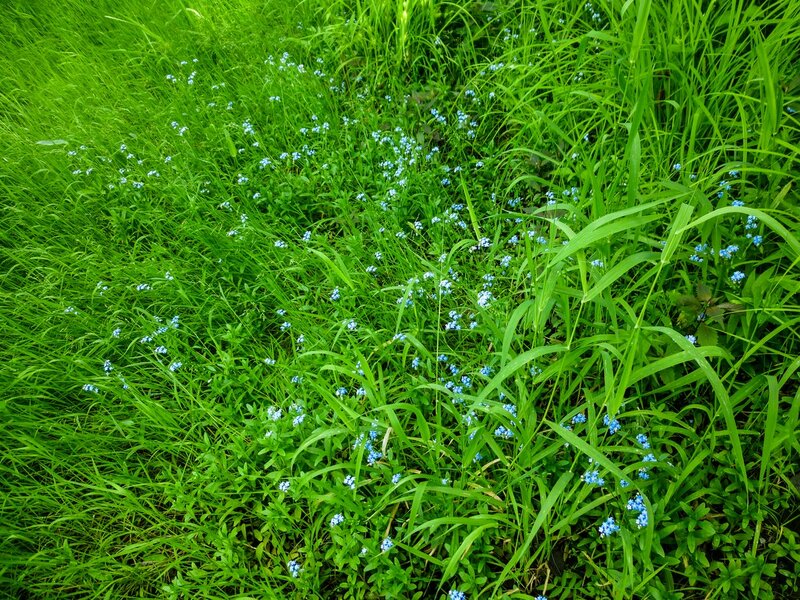 Forget me nots lined the river bank. There were thousands of them, far more than I’ve ever seen in one spot. Forget me nots or no, I won’t forget this place. In fact I’m having a hard time staying away. Thank you Ben. It was a long way from water, just walking the old road like I was. There are some places that never fail to put a smile on your face and this is obviously one of yours. You found some great plants too, most I don’t recognise as we don’t have them but the forget me nots are common here. Yes, it’s a great place to feel like a kid again. It’s too bad you don’t have the lilies. They put on quite a show! 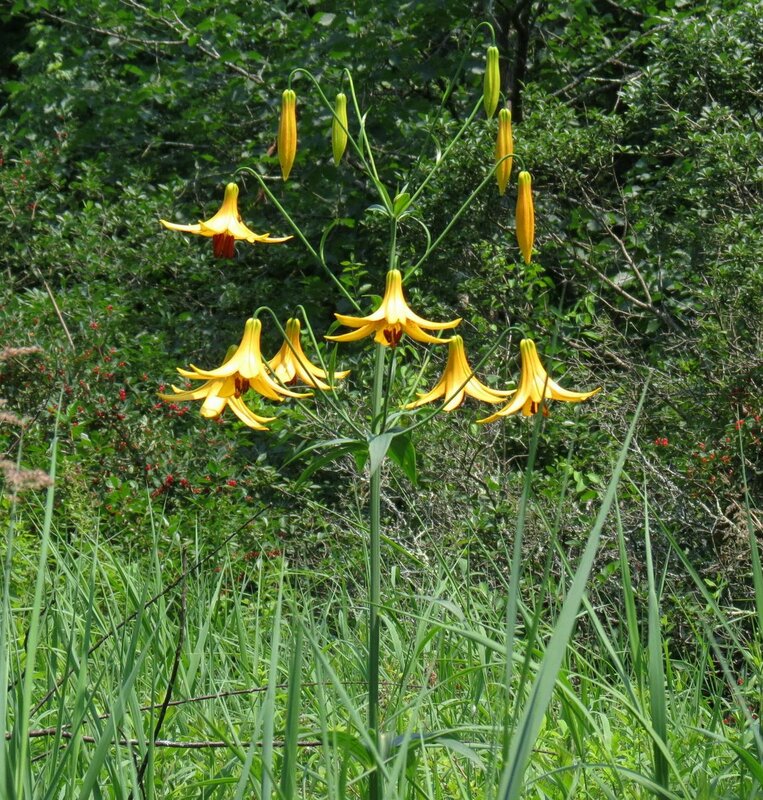 Unfortunately, as far as I know we do not have the Canada lily in Ohio. According to the USDA you do, but all that means is someone might have seen a couple of plants 50 years ago. It’s hard to really say unless you see them for yourself or see photos of plants that were taken there. Love that you have discovered a new spot to explore! Looking forward to watching the changes here. Thanks Martha. Chances are good that I’ll find plenty of interesting things in a place like this, being so near the river. How exciting to have a new place to discover, especially as it has been left undisturbed. The flowers and plants you find are so lovely and I enjoy reading all you have to say about them. The quote you have found is wonderful. Thank you Clare, I’m glad you enjoyed the post. This place is a real treasure and I look forward to spending more time there. And I look forward to your posts about your visits! I’m sure there will be a few more! There’s no telling what you might find in a place like that. So many great captures. Fascinating stuff about the wintergreens and that Canada Lily is such a beauty! Thanks! The Canada lilies are like the icing on the cake for summer flowers. Looks like you found a new favorite place! I love those Canada Lilies! Yes, I’ll add it to a very long list of favorites! Those lilies are one of those plants that can stop you in your tracks, because they get so big. 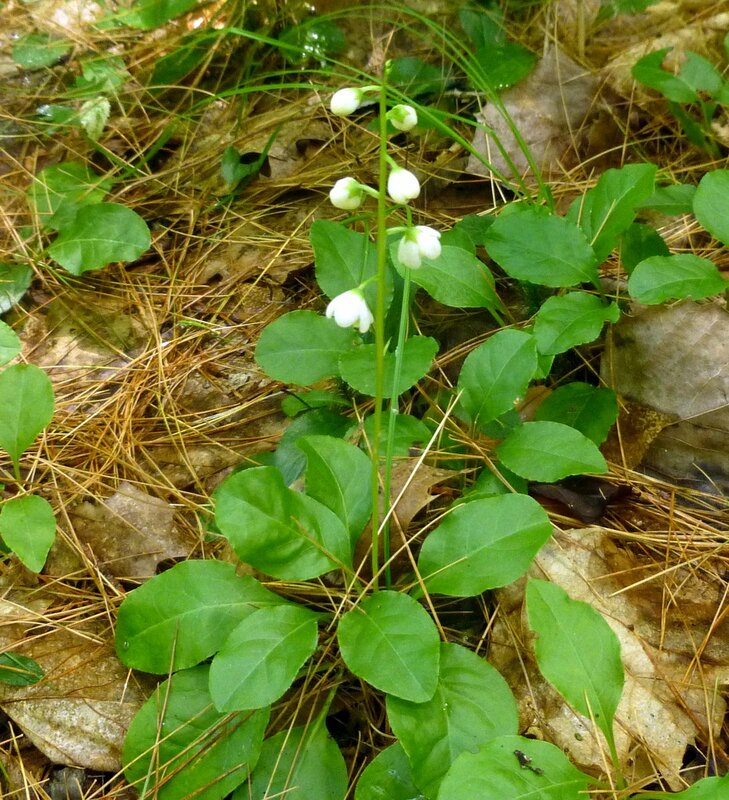 I did not know that about the striped wintergreen and explains why I don’t see it often. Thanks or another interesting tidbit! You’re welcome. Striped wintergreen has great camouflage too. I’ve visited places where I knew it grew and couldn’t see it without getting down on my hands and knees. It can be very hard to see at this time of year especially. The Canada lilies would be worth the trip all on their own. What a great find! I’ll bet that you were like a kid again, in your own personal candy store. I loved the Canada lily and the whorled loosestrife in particular. 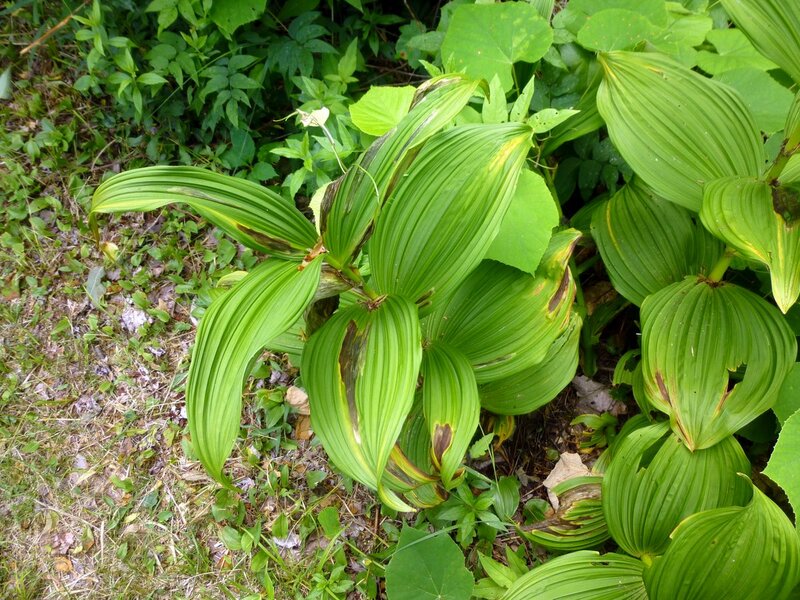 I don’t think that the Canada Lily grows in Michigan, I’ve never seen it and it looks like it would be hard to miss. I went looking for the whorled loosestrife here on Sunday, but wasn’t able to find any. Our Michigan lily is about to bloom, I keep checking them when I can. I can only imagine what you’ll find on other visits there at other times of the year. Large tracts of undisturbed land is hard to find, but harbors so many wonders seen nowhere else. That’s what it was like Jerry! Everywhere I looked I saw interesting things. According to the USDA Canada lilies don’t make it as far west as Michigan but you’re right-if you ever see them there won’t be any doubt. The Michigan lilies are every bit as beautiful and I hope you find some. Whorled loosestrife should be growing near water, most likely. That’s usually where I see it. I have a feeling that I’m in for some surprises on this land. It’s quite a large area and I haven’t even scratched the surface. I’m sure you’ll hear more about it! I’d drive out of the way to see the Canada lilies too! I’d bet that you would. They’re real beauties! Every bit as showy as garden lilies too. Thank you for doing that, Schuyler. I hope someone takes care of that tree. I’d do it myself if I still owned a chainsaw. I think you’d probably like Dickinson forest. If you’re ever down this way send me an email and I’ll show you around. It sounds like you’ve got a dream job. If I could work at this and be paid for it I’d be a very happy person! A very interesting post. Now, pls. tell me: can you send some of those Canada lilies up here to me in Canada? I’ve never seen them before, but they are lovely. OK, just kidding. With a name like that, they must be in a woodland here somewhere. That’s funny Cynthia. Actually another name for them is meadow lily and they grow where the grass will get quite tall-places that don’t get mown more than once a year. I also see them growing along streams quite often. They seem to like water and a lot of sunlight. Love the Canada lilies – never seen anything quite like them. Having a hard time imagining them at seven feet high. Hope to stumb!e across some of them myself, some day. Thank you Judy. Yes, the Canada lilies often soar up over my head. They’re one of the tallest lilies that I’ve seen. I don’t know if you have them in Michigan but you do have the reddish orange Michigan lilies which are also very beautiful. 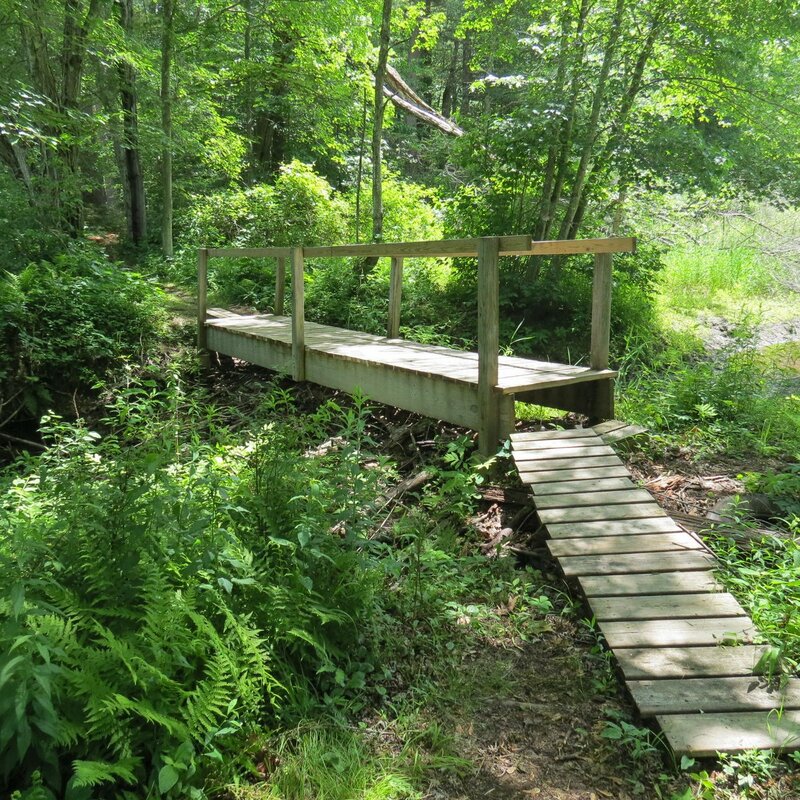 Have you explored the upper Ashuelot headwaters area in Washington and Lempster? I haven’t Heidi, but I’d sure like to someday! It is such a happy feeling when a place can take you back in time. With all your great finds, I’m sure you will visit many more times. I recently found several huge colonies of whorled loosestrife. The canada lilies are beautiful. Thank you Laura. Yes, this is a special place that I’ll visit often. The lilies are doing really well this year and they obviously like it there. I’ve noticed that whorled loosestrife also seems to be doing well. I’ve seen some big colonies of it too. Thanks again for a wonderful guided tour, Allen. Every time I read one of your posts it seems like I learn of new toxic plants–I’m glad that I have no inclination to taste the beautiful plants that I see. You’re welcome and thank you Mike. I started mentioning the toxicity of plants because there are a lot of foragers out there who do eat plants. (and mushrooms) It might seem at times by reading this blog that they’re all toxic but most plants really aren’t. I just happen to find a lot of the ones that are. A place that beckons. One of these days…. you document such interesting walks, illustrated with your excellent photographs. I particularly enjoyed the Canada Lily and the story you told. Thank you Susan. The lilies are spectacular this year!